Fish Creek was once very accessible but now has a quarry operating at the end of the canyon. 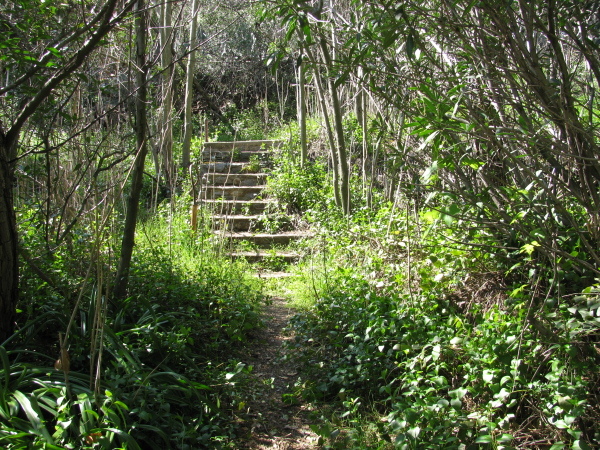 Now it can be got at by way of a much longer trail that climbs the ridge and drops into the canyon surrounded by a truly amazing amount of poison oak. This trail seems to be the domain of stringy old hikers who can manage to make it to the trail by 7AM. However, on cerain Saturdays, the quarry runs a shuttle through their operations so that if you can start by noon and be out by 3PM, the average 5-year-old can make it up to the falls. The vans were running today, and I saw a lot of young kids, some of them even walking it themselves. The trail heads out over a bridge and into the canyon, turning a few sharp corners quickly hiding the quarry from view. 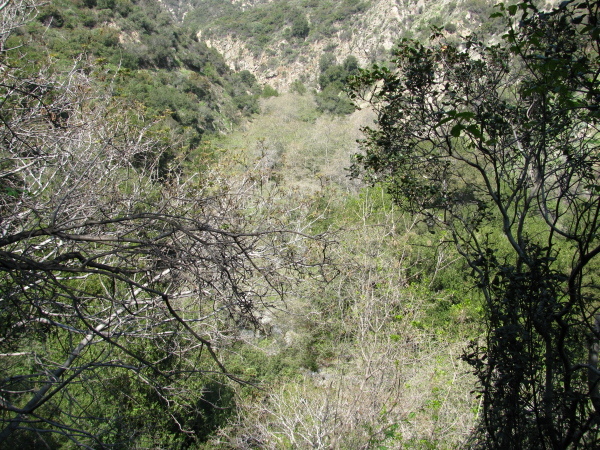 The canyon itself is rather narrow and steep with water leaking out the left side here and there. The trail stays fairly high up on the left side most of the way until that side becomes a sheer cliff. Then it crosses over and soon after the creek can be found tumbling down that cliff. The canyon as the trail starts off high on the side. It gets quite a bit narrower. Someone's put up a few signs in the first part of the canyon to tell a little about the history. One of these points out that this is the only place in the San Gabriel Mountains to find a particular variety of Matilija poppies. Most say things about the cabins that are now just a few ruins and their former residents now all gone elsewhere. Steps seem to be the only thing left of this cabin, although there may be more to see in among the thick growth of young trees.